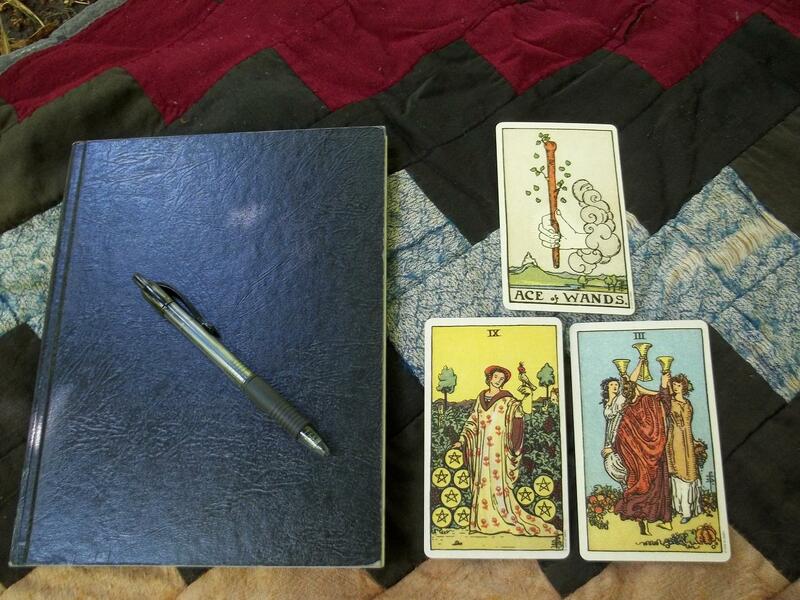 I love writing and I love combining tarot and story-telling. Using the cards for writing prompts and designing spreads to generate story ideas are two fun ways to do that. The spread that I’m sharing today produces a general plot outline. The purpose of the spread is to get the creative juices flowing, perhaps even open pathways to the muse, who is quite a fickle creature. When it comes to “interpreting” this kind of spread you aren’t really looking for “accuracy” as much as you are looking for something that clicks with you creatively. The amount of freedom you have is what makes it so much fun. As you go along ask yourself…What in the cards is exciting or compelling? If you start on the first few cards and then completely deviate away from the rest… who cares?! It’s your story! You’re on a roll! The inspiration is flowing!…That is what the spread is designed to do. Card #1 – Hero/Protagonist: This card will represent your main character. You can separate the court cards from the pack, shuffle and select one if you want to get a definitive personality type. I use the whole deck myself. Card #2 – Current Situation: These are the circumstances that the character is experiencing at the beginning of the story. It can describe an emotional state or physical situation. Usually it will have some undesirable aspect that will operate as the catalyst for the story. Card #3 – Goal: This may be closely related to Card #2 or it may be the catalyst for the story by itself. It is what the character is attempting to accomplish. If it relates to Card #2 it is likely a remedy for the current situation, if not the goal is driving the character and the plot on its own. Card #4 – Obstacle/Conflict: This is the thing that is getting in the way of the character’s goal. It can be a person or circumstances or a character’s own flaws. It can be related to card #2 as a specific aspect of the current situation. Card #5 – Who Will Help/Ally: This is a person, a secondary character that will assist the protagonist in achieving their goal and/or overcome their obstacle. I suppose this could also be considered as “what” will help if you don’t want an additional character here. Card #6 – Who Will Hinder/Villain: This is another secondary character who will get in the way of the protagonists progress. 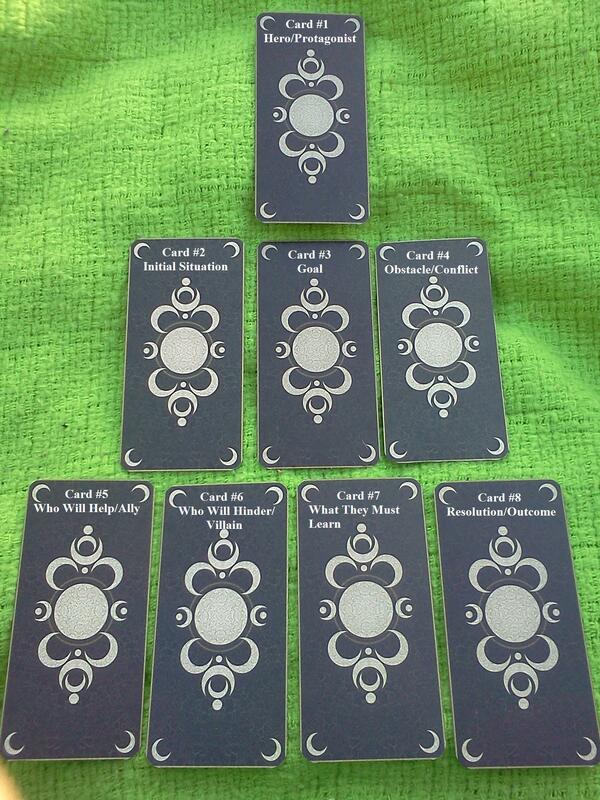 It can be the villain of the story, it can be an accomplice if you’ve already identified a villain in Card #2 or Card #4, or it can be a secondary or independent obstacle. Card #7 – What They Must Learn: This can represent an area of growth, a point of transformation or a lesson that the main character must learn in order to overcome the obstacles that stand in their way. Card #8 – Resolution/Outcome: The completion of the protagonist’s journey, the culmination of their efforts. This is the moment that the rest of the story has been leading up to, where you tie everything together. I hope you enjoy working with this spread and I would love to hear from you, so feel free to comment below. Looking for more creative writing spreads? Check out these other articles.